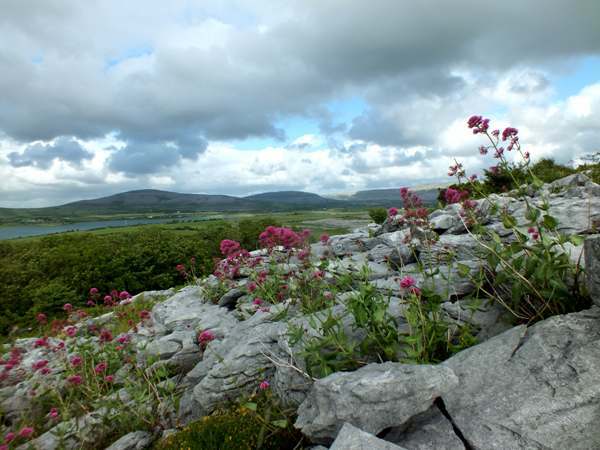 A walk on the wild side is not necessary if you want to enjoy the sight of masses of Red Valerian, because this wildflower is very much at home in urban settings too, although it saves some of its most spectacular displays for rocky limestone-rich sites such as south-west Ireland's famous Burren (shown above).. Individually the flowers are 8-10mm long and comprise a corolla in the form of a slender tube with five lobed petals of unequal length and a small spur at the base. Originally a wildflower of the Mediterranean region, this European wildflower has been introduced into the wild in northern Europe, mainly via garden escapes. 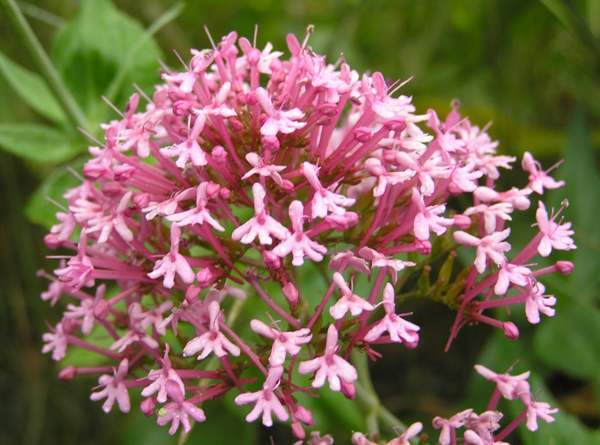 In parts of Australia and North America where Red Valerian occurs it is an introduced alien species. Between the stonework of walls, bridges and other vertical surfaces seem to be very attractive to this pretty wildflower, which is most commonly seen in coastal districts. 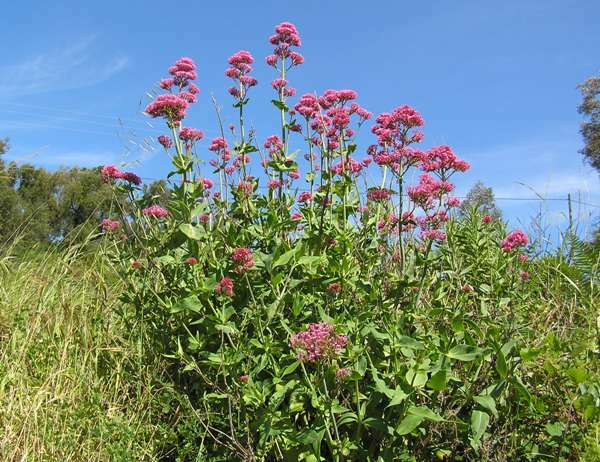 Red Valerian is a common sight on railway embankments and coastal paths and on some reservoir dam walls. 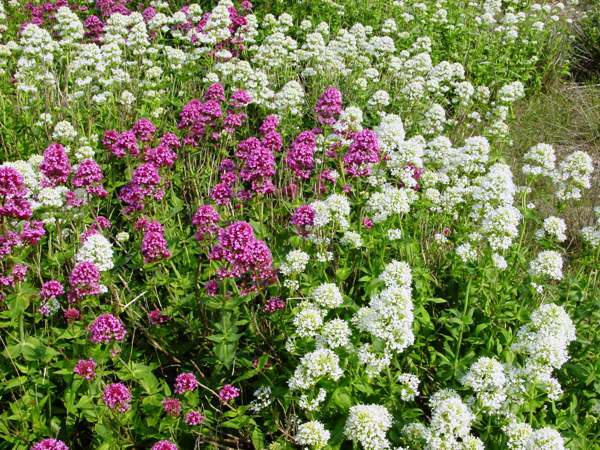 The flowers first appear towards the end of May, andyou will find red valerian (which also has a white variety, as shown above) in flower right through to the end of September and in sheltered places right through to the end of the year. The leaves of Red Valerian and roots can be eaten - the leaves either fresh in salads or lightly boiled, and he roots boiled in soups. Opinions differ as to whether either makes particularly good eating. 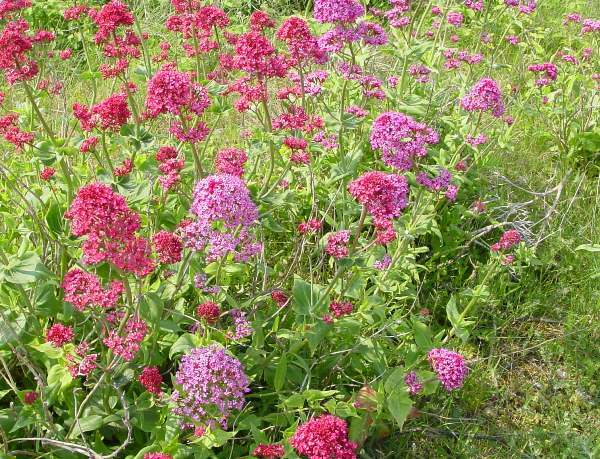 Although Red Valerian is reported by some sources to have medicinal properties, this is probably due to confusion with Common Valerian, Valeriana officinalis. Centranthus, the generic name, comes from the Greek words kentron, a spur, and anthos, a flower. The specific epithet ruber means red - a reference to the colour many but certainly not all of the flowers of Red Valarian. Common Valerian Valeriana officinalis has very similar but much paler pink flowers; it usually blooms from June until the end of August. The leaves of Common Valerian are pinnate, pointed and toothed, whereas the leaves of Red Valerian are oval or lanceolate.